Amoudara is located on the northern coast of Crete, a few kilometres from the capital Heraklion and also to Knossos. Amoudara holidays have something for everyone with long stretches of sandy beaches, warm clear sea, many sightseeing opportunities, and a wide variety of leisure activities both in and out of the water. Holidays in Amoudara therefore attract families, couples of all ages and groups of young singles. Check out our cheap Amoudara holidays and you'll be pleasantly surprised at their good value. 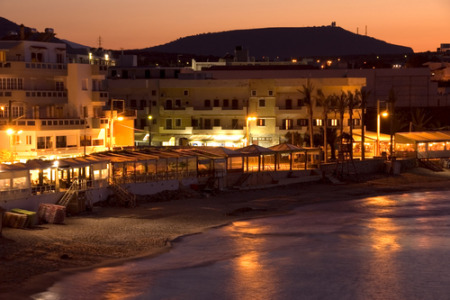 With accommodation providing all modern amenities, restaurants catering for all tastes and bars discos and clubs, supplying a lively nightlife, it is no surprise that holidays to Amoudara are very popular. Our low cost Amoudara holidays disappear like hot cakes so book early to avoid disappointment. If you are looking for a spring break of simply wish to escape the vagaries of our British weather, surf through our Amoudara holiday deals and you may find one to suit. For further information, and to find our latest Amoudara holiday offers, please use the search facility.